“Everybody is beautiful in their own way” is a cliche that accurately describes Sadie Hawkins 2018. With all the attendees looking absolutely stunning, here are some of the best-dressed people. Emma Karas with her date Akshaya Pradhan, Class of 2019, at Sadie Hawkins 2018. “Pulling it together the previous night,” she managed to look wonderful in an ankle-length velvet dress. 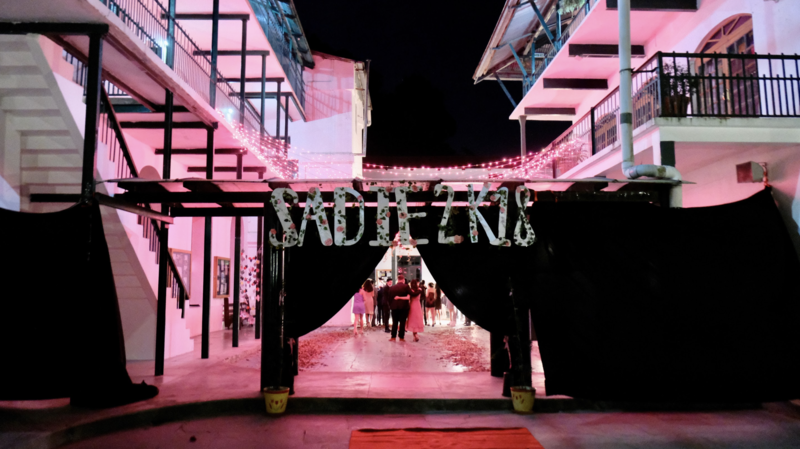 Red Dorji with her date Jaydeep Bajwa, Class of 2019, at Sadie Hawkins 2018. “Stealing from [her] sister’s closet,” Red Dorjee showed up with the most elegant dress of the night. Syma Sahu with her date Yongbean Chung, Class of 2020. She showed up to Sadie Hawkins 2018 in a wine-colored netted bodycon dress. Zorawar Sethi (left) and Abhick Mehrra, Class of 2020, at Sadie Hawkins 2018. Both wore a bouble-breasted suit. Sethi got inspired by John Legend and Mehrra by his father. Giju Kim and MinJae Kim, Class of 2020, showed up to Sadie Hawkins 2018 with identical pairs of vans and a unique fashion sense.